1. Preheat the oven to 200°C, gas mark 6. Place the tomatoes and garlic in a large roasting tray, drizzle with 1 tbsp basil oil and place in the oven to roast for 25 minutes until the skins burst and natural sugars have caramelised. 2. Remove from the oven and leave to cool slightly before tipping into a liquidizer, with the sundried tomatoes and the garlic, squeezed from its papery skin. Add the brown sugar, basil leaves, red wine vinegar and the remaining basil olive oil, blitz until smooth, pour through a sieve into a jug, season and set aside until ready to serve. 3. 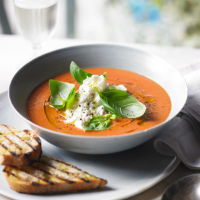 Ladle the soup into shallow bowls, top with the torn mozzarella and a sprig of fresh basil. Grind over some cracked black pepper and a drizzle of extra virgin olive oil and serve with griddled sourdough on the side. This recipe was first published in Thu May 15 09:00:00 BST 2014.